Shades of blue have always been my most flattering colors because I have blue eyes. 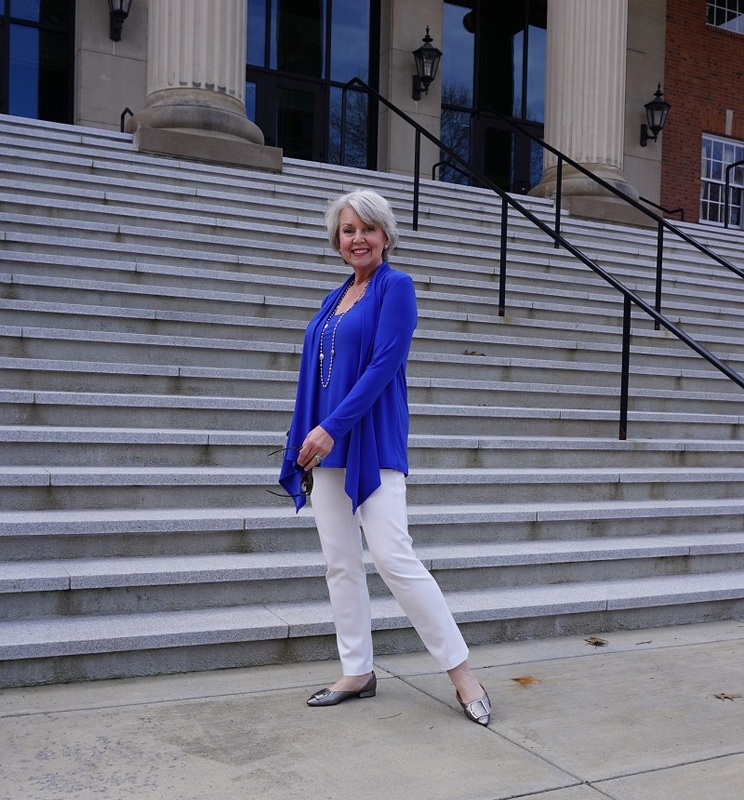 A blue top with white pants is one of my most effortless warm weather outfit combinations. Do you have an ideal color combination that always seems to work for you? 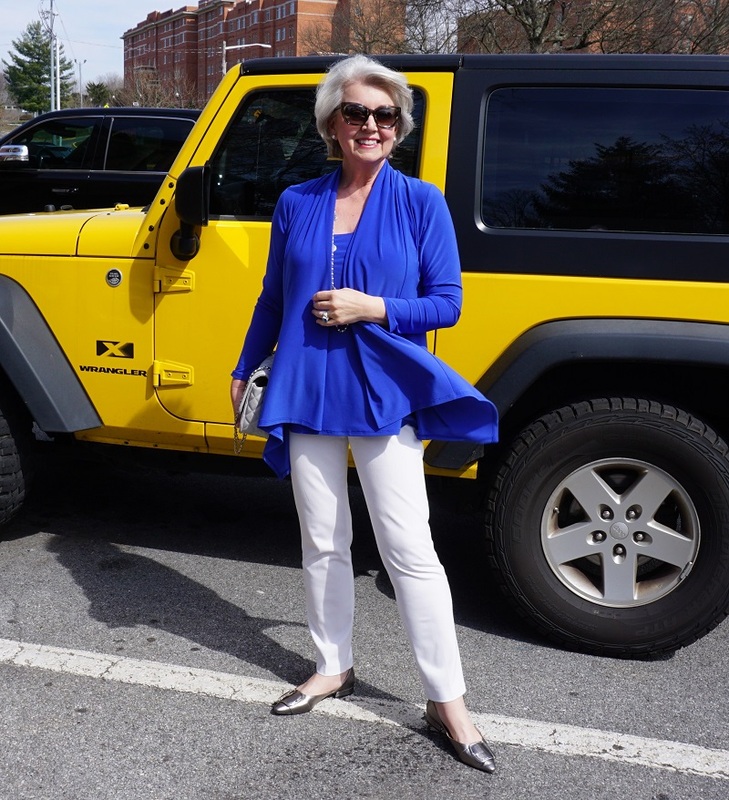 I recently wore my Dazzling Blue tank and matching topper to brunch. The pieces are by Clara Sunwoo via My Fair Lady from last year. This set in Dazzling Blue is not on their website this year, but they do have a navy set here. Use the discount code April19 to get 15% off through April 15, 2019, at My Fair Lady. The white jeans I am wearing in these photos are the Lior Paris pull-on style here. The pants are from My Fair Lady as well. These items were gifts last year from my friends who own My Fair Lady. My long silvertone necklace is from Chico’s last year. Similar here. The handbag was from Express a few years ago. Similar here. The shoes are by Franco Sarto here. Referral and affiliate links in my posts may generate a small commission for Susan After 60 Inc. 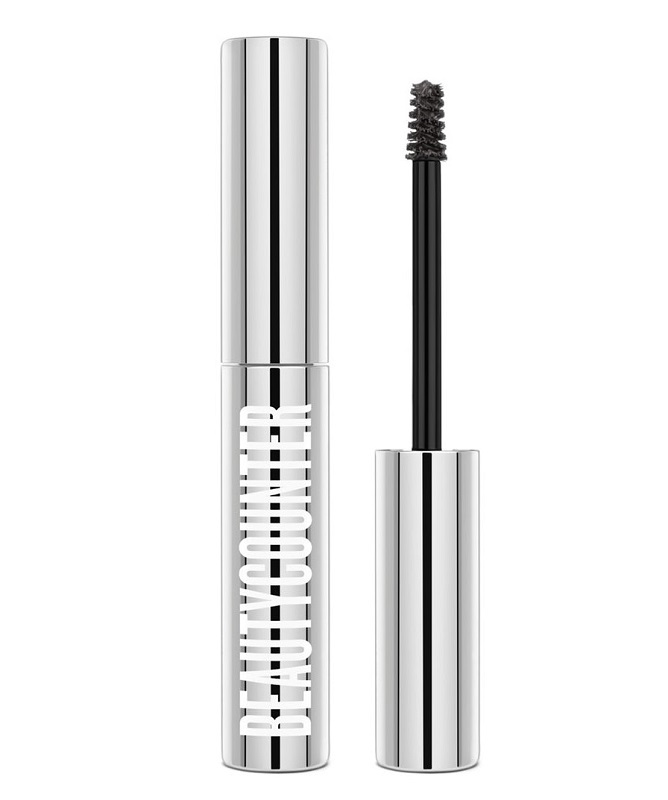 If my brow makeup is looking more natural these days, it is due to the Beautycounter brow mascara I’m using now. Have you noticed that most brow colors go on your skin leaving the hairs light and visible? I love how this product brings the individual hairs into the game as well. I brush on the Soft Black here and then use a clean spooly brush to remove any excess. Epic! The photos of me are by Mr. Mickey. We shot them on the campus of ETSU and also at The Blackthorn Club later in the day when we had brunch there. The blog post for Friday will share how I use inspiration from Pinterest images to recreate similar looks using what’s already in my closet. Have a beautiful day! Susan, still having problems when you say you got something “here” and you click on it, it takes you to a screen that says “API.shopstyle” at the top but it never shows a picture. Any idea why? If you are looking at my blog from your phone, you may be having trouble with an internet connection or may be that it is just very slow to connect. I’m not sure why else this might be happening. 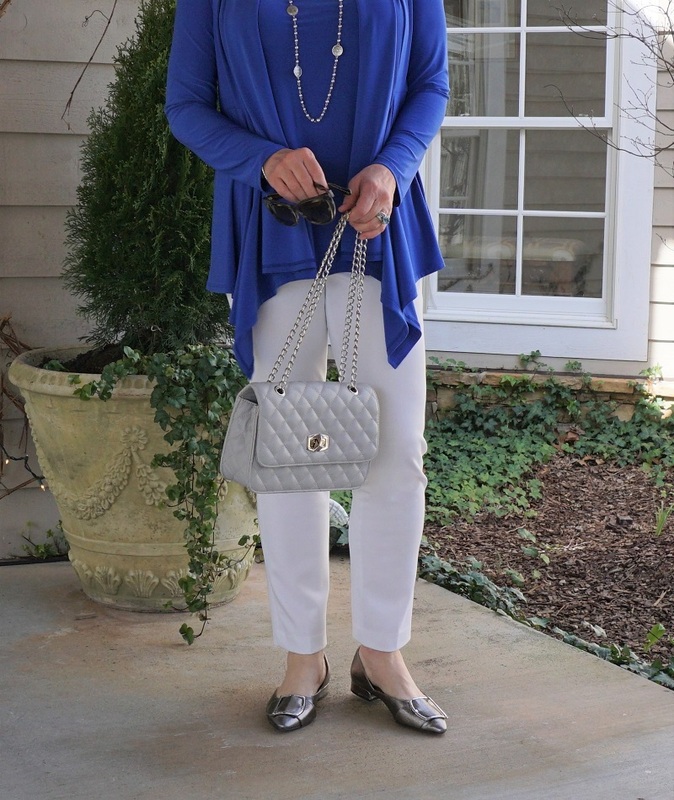 Your blue top is beautiful and the whole outfit simply put together yet so effective! The flower! Beautiful touch to your inspiring blog. Thank you for all that you do, Susan. Your brows always look great! I remember your fabulous “brow you-tube video”. I use clear brow gel first, to “tame” the unruly hairs, which works well as an adherent for the brow powder I brush on afterwards. 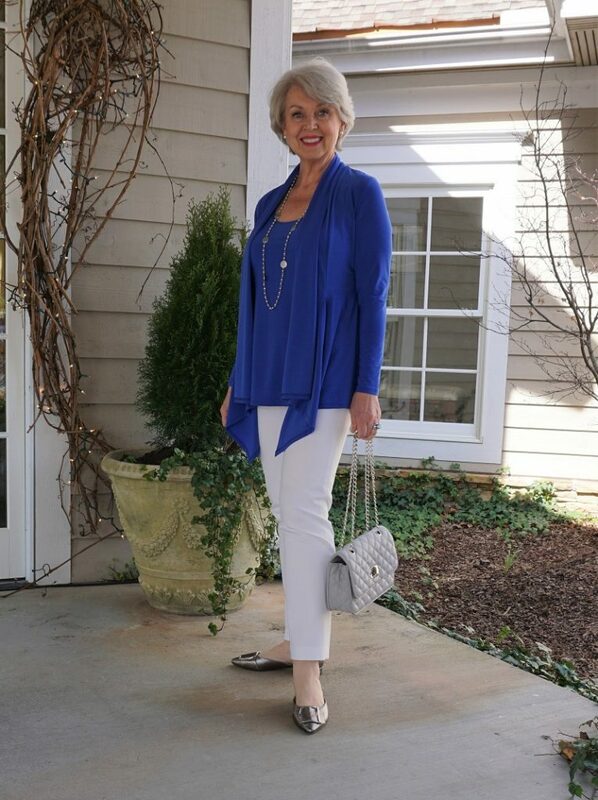 Your look today is lovely and reminds me that just yesterday I bought a new pair of white pants (similar to yours) and a sweater set that has blue in it! 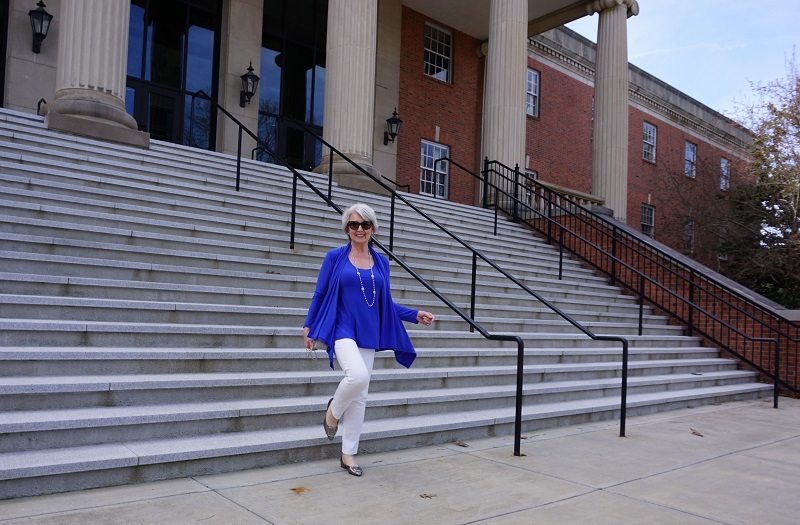 (For any petites out there, my pants were the Cotton Ankle Wonderstretch Pant from Nic & Zoe.) As usual Susan, you inspire us with your elegance, taste, and wisdom. 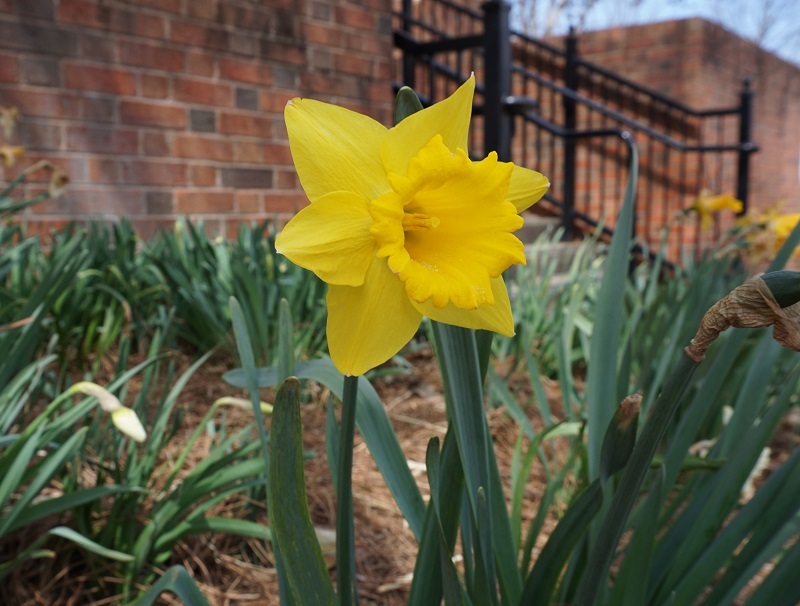 Love that daffodil! My annuals are beginning to peep open too! Love the blue top. I struggle with white pants- I feel like I don’t have the body for them! Haha! Love your shopping philosophy and thinning down of our closets! Susan, you have a gift to know what looks good together and you also recognize the beauty that is around you. I love that you added the yellow flower. It is so cheerful. As always, say hi to Mr. Mickey and thank him for helping with the pictures. Bright colors have always been good for me. Aqua is my favorite but I do well with rose, yellow and blue. I have never been fond of the earth tones on me unless they are rich deep shades. It is so nice following your blog. When I search for spring clothes I am disappointed when the torn jeans and short skirts appear. Not for my age group. That shade of blue is stunning on you! I would feel as if I were wearing pajamas in this particular color. Love the yellow contrast with the blue!! Perfect!! Thanks for the eyebrow tip!! I will try it! Hi Susan the blue is stunning and I absolutely love how you’ve accessorised the outfit. You are an aficionado when it comes to turning clothes into an outfit. 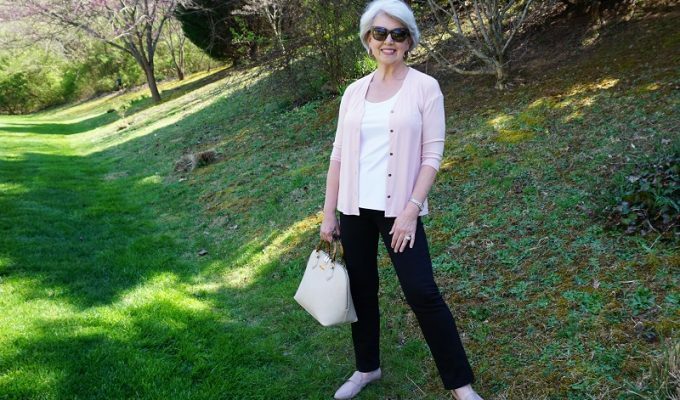 I believe a straight leg pant rather than the wrinkled,calf hugging pant leg is much more flattering on you. These are straight leg pants. Many people from our generation believe that wearing long, loose-fitting tailored pants looks better, yet it can make us appear stuck in a different time. I’ve heard young people refer to those pants as Grandpa pants. Susan, you look beautiful in that blue. I look forward to reading your blog. I love that you have such an optimist outlook on life. You see the beauty in the world around you. I was wondering if at your lowest time in your life if you ever considered antidepressants or counseling? Do you practice mindfulness or read books that help you maintain such a positive attitude? You always offer such great advice on fashion and food that I figured you had advice on staying positive. I try to look on the bright side of every situation. It serves no purpose to waste energy dwelling on the past or what could have been. Look forward to every new adventure and keep an open mind to change. I do not tolerate medications of any type well. Self-discipline and concentrating on what brings me joy has helped me tremendously during the lowest points of my life. I am new to your site and enjoy seeing your choices. Could you possibly do something showing how people with a Walmart budget and are short in height can look nice too? Sometimes when we have a budget that is small we just don’t try. Please read the blog post for tomorrow. I address how to make the best use of what you have and also how to make better and more budget-friendly choices in the future. 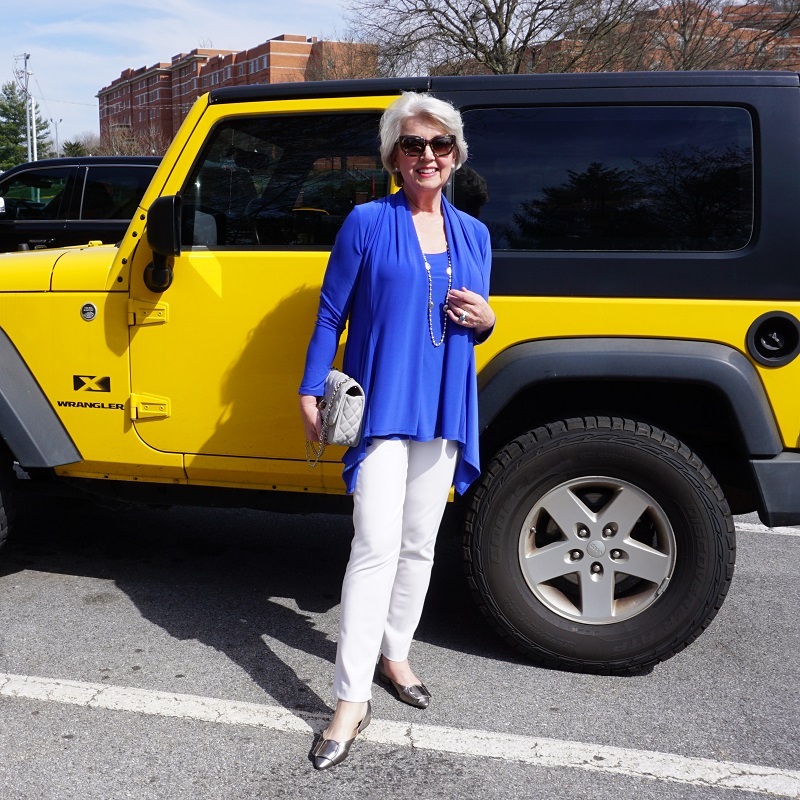 And here I thought you bought a yellow Jeep Wrangler! Personally I am going back and forth between a lime green one or yellow. Hmmmm choices, choices . Love the blog and that color you are wearing! This is a comment on Monday’s post about the Everlane cashmere sweater and how it would fit a petite. I usually take PM in a sweater; I ordered the Everlane in medium and it arrived today. It is a lovely cashmere and a nice weight. The sweater fit me in the body (could not have gone down a size), and the sleeves would work with turning up, but it came to the tops of my thighs (tunic length). Not a good look at 5’2″. So in answer to your reader’s question, while this look is gorgeous on Susan at 5’6″, I doubt it would work on many petites. I will be returning. There is a $6 restocking fee. Hope this helps someone. Thank you for sharing this info, Cheryl. Love the color combination. It is one of favorites also. Are you wearing any hose or hidden socks with your outfit. 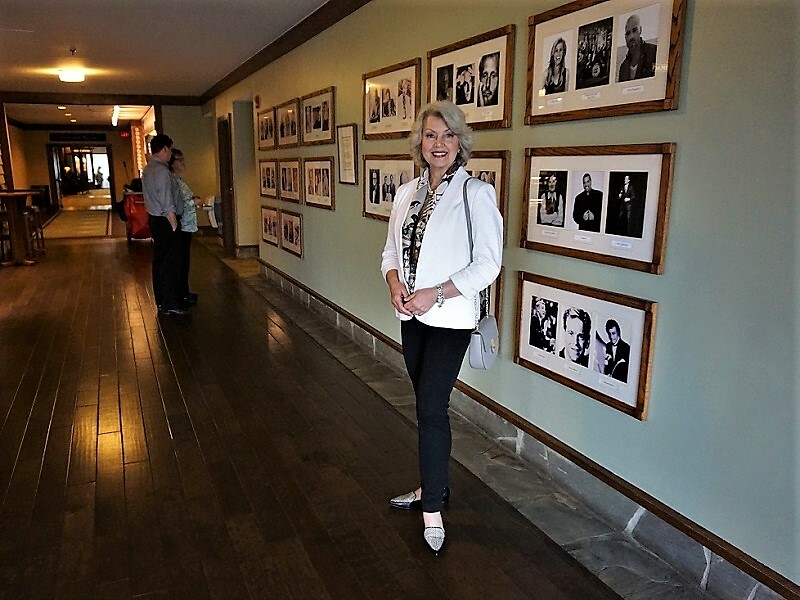 I am uncomfortable wearing shoes without some kind of hose or socks but think a bare ankle looks better in the spring….don’t know how to do that with neutral shoes. Easy to wear matching black,brown, or navy in the winter. Try SheecSocks for no show socks that stay on your feet inside your shoes. They also protect your pedicure! I had bookmarked the SheecSocks when I first read your recommendation some months ago. Got them last week and they are simply the BEST no show socks. Love them. Thanks. That is a genius idea, putting mascara on brows so the hairs actually show! Wow. And it works. Had to rush in and try it. Perfect. Just need a dark brown mascara. Do you “fill in” your brows in addition to using the mascara? My son is getting married next weekend, and I have spent the week trying makeup. Now that you’ve taught me the colors I need to be wearing, it dawned on me that I might be wearing the wrong colored makeup, particularly eye shadow. And, yes, I was. Wow, what a difference the right colors make. And now I don’t mind lipstick. It always made me feel like a clown. But the right shades really make my entire face brighten up. Thank you, again, Susan. Wonderful to hear that your look is coming together! Yes, I fill in the brows and the use the brow gel to color the hairs as well.